Ackermann’s Repository of Arts, June 1814. I love prints showing dresses from the back. Not only do we get to see details of construction, but sometimes, as here, we get a glimpse of the hairdo from behind. Though this appears to be a somewhat simple underdress and tunic, the trimming of lace and silver beads must have been stunning in person. 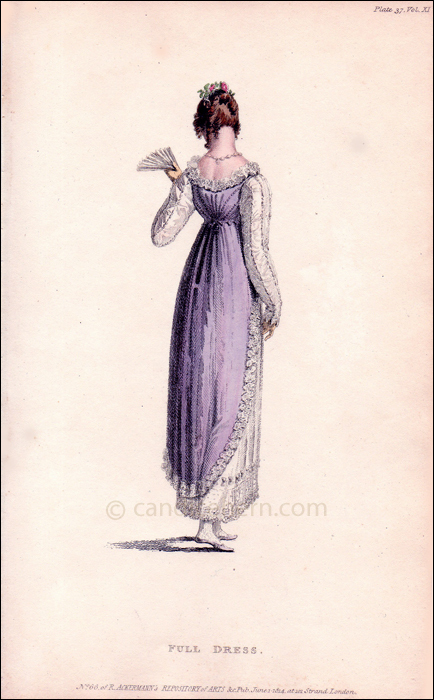 “EVENING OR FULL DRESS. 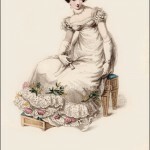 A white satin slip, terminating at the bottom with a flounce of French blond, headed with tufts of the same; a short tunic, rounded at the corners, of evening primrose colour striped gauze, trimmed entirely round with tufts of blond lace, corresponding with the heading worn upon the slip; a low shaped back ornamented down seams with silver bead trimming. 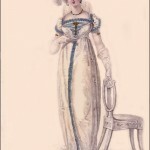 The tunic is united at the bottom of the waist in front, and has a stomacher of white satin affixed to the slip, ornamented with silver trimming, corresponding with the back. 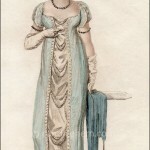 The sleeves are composed of tull or silk net and white satin, with four drawings, of easy fulness, lengthwise of the arm, severally edged with silver beading, and terminate at the wrist with a silver Vandyke fringe. A corresponding belt round the waist is tied behind with tassels. The hair combed up smoothy behind, and brought forward, falls in irregular curls over the face, confined upon the crown by a short wreath of flowers. Ribbed silk stockings; lilac kid slippers, embroidered with silver; Limerick or white kid gloves; pearl necklace and ear-rings.